Get 10% savings on total bill with minimum spending of RM25. Redeem your TreatPoints On-The-Spot here! 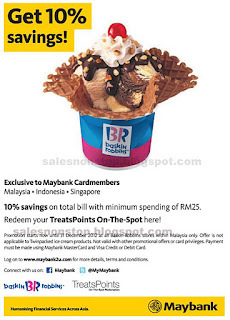 Promotion valid at all Baskin-Robbins stores within Malaysia only. Offer is not applicable to Twinpacked ice-cream products. Not valid with other promotional offers or card privileges. Payment must be made using Maybank MasterCard and Visa Credit or Debit Card.